eykyn : fiji and hawaii, 1896. Thomas Eykyn : Fiji and Hawaii, 1896. 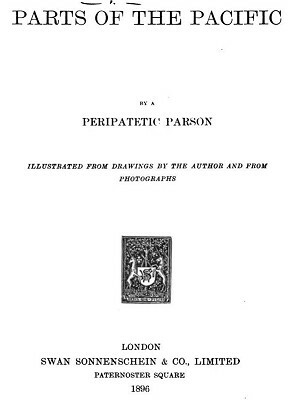 Parts of the Pacific by a Peripatic Parson. Swan Sonnenschein & Co, London, 1896. Bathing in the tempting waters is not very safe ; for, although Fiji is free from horrible alligators, sharks or dog-fish are found almost at the head of the rivers ; and the sea abounds with sharks, sea-pike, poisonous fish, and water snakes. In one of the brooks I got out to push the boat ofif a shoal. The craft went off down stream admirably, but, alas ! I was left among a lot of little shells each provided with spines a quarter of an inch long, which stuck fast into the soles of my feet, causing exquisite pain, increasing at each step until water was reached deep enough to swim after the boat. I did not mind, however, for did not the mishap afford my companions a great deal of amusement, as well as the trouble of getting the prickles out of my feet with their knives ? How glorious it used to be sailing up or down the coast inside the reef, watching the huge breakers lifting their clear waters in the bright sunshine like liquid emeralds, as they expended their fury upon the coral breakwater ! And as the boat bobbed about over the swell that extended within, one was never weary of gazing down through the ever-varying tints of blue and green to the coral beds below. And was it not exciting when out-side the reef, shooting the craft, under sail, through the narrow openings in the coral to reach the inside, on the crest of a big wave, with the surf roaring upon the shoal, only a few yards off on either side ? But the chief delight of all was surf-swimming. Men and women swam out to sea with properly-constructed planks, diving through the waves, and then returned, kneeling, or even standing on the plank as it sped along just behind the crest of the wave, or just in front of the curling roller. Jumping feet first into deep pools was also a source of great pleasure. Pure natives are mainly people of the lower order now-a-days. They are all well educated at Government schools ; but the ancient custom of doing no work prevails, and little exercise is taken ; for intertribal wars have ceased, and public works are done by contract. Even surf-swimming is almost unknown. I did not see any. About the only native recreation that survives is gambling. A few Hawaiians have adopted the fine American game of base-ball, and they are fond of riding; but for the most part, the splendid occupations of old have been ruthlessly abolished, and no corresponding employment substituted. Children are fond of flying kites ; and it looks pretty at Honolulu, after school hours, when the sky is studded with kites let out to a great height. Then, as the trade wind falls in the evening, they all come fluttering down in a great hurry. Geoff Cater (2012) : Thomas Eykyn : Fiji and Hawaii, 1896.